A parking cop ends up dead. Jules Landau is pulled into his second murder investigation despite the opinion of his father and his friend. The trail of blood leads him into a plot involving Russian gangsters and local politicians. This is my second time reading a book by Mr. Krulewitch, and like the first one it didn’t disappoint. He manages so well to capture the dark feel of a dark, depressive area of Chicago. While set in modern times, it captures the whole feel of what the city may have been like under the rule of Capone and his compatriots. The plot is very well laid out, and logically fits together. The characters are well developed, and as a reader I find myself caring about them and involved in their lives. While some of the mystery aspect is easy to guess, it still keeps you thrilled and reading on until the very last page. 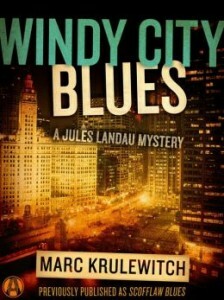 OVerall, a very recommended book, and I look forward to more adventures of Jule Landau. Rated PG-13 for older teens and adults due to language, and violence. For a great weekend thriller though, grab a copy, drop back by and let us know what you thought. *Disclaimer* A special thanks goes out to Lisa at TLC tours for a review copy of this book. It in no way influenced my review. You can discuss it here or join my facebook page and discuss it there.